Say the button is beige - it's just the light that makes it look yellow!! This is a really stunning card. The tulips look so textured. I love the lighter strip you've based the tulips in. Glad you had a good time! Lovely Sylvie , I love the bright daisey against the muted colours , Fab card well done . Welcome back, Sylvie...pleased to hear that you had a lovely visit with family. This is really pretty - the flowers are lovely. So glad you had a nice time on holiday. 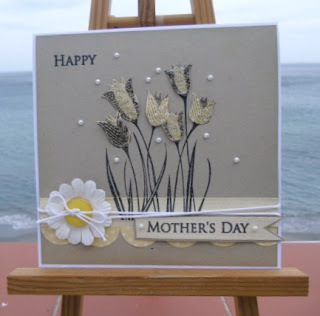 Beautiful card, lovely details and textures, I would say yellow is on the beige spectrum ....ish!! But it looks perfect as the centre so hopefully it won't be noticed...lol. Hola Sylvie, gorgeous card, very elegant, your flowers are fantastic. Fabulous card Sylvie - lots of texture. Nice to see you back Sylvie.....pleased you had a good time and managed to buy a few crafting goodies! Glad you had a good trip Sylvie. This is a gorgeous card! Funny you should mention the yellow button Sylvie... my eye went straight to it... tut, tut... but apart from that it's ab fab! what a fabulous card, sylvie!! glad you had a nice trip and got to bring home some new goodies!! Glad you had a good time and what an elegant card you made! Superb card Sylvie. Love it. wowie what a really beautiful card you've made, very lovely! Sylvie, it's a fab card...yellow button and all! Of course, one could argue that the yellow is so "neutral" that it really fits! LOL! love the textures, great card. This is beautiful. I love those flowers. They're gorgeous. Ann Y. So beautiful Sylvie! I just love how you made those flowers pop! Did you buy any crafty stash while you were here? This is gorgeous Miss Artist! Sylvie, I cannot get over your talent - please send me some! !